Variations in antibody structure allow great diversity of antigen recognition among different antibodies. Antibodies contain four polypeptides: two identical (to each other) heavy chains in a “Y” formation and two idenitical (to each other) light chains on the outside of the top of the “Y” portion. 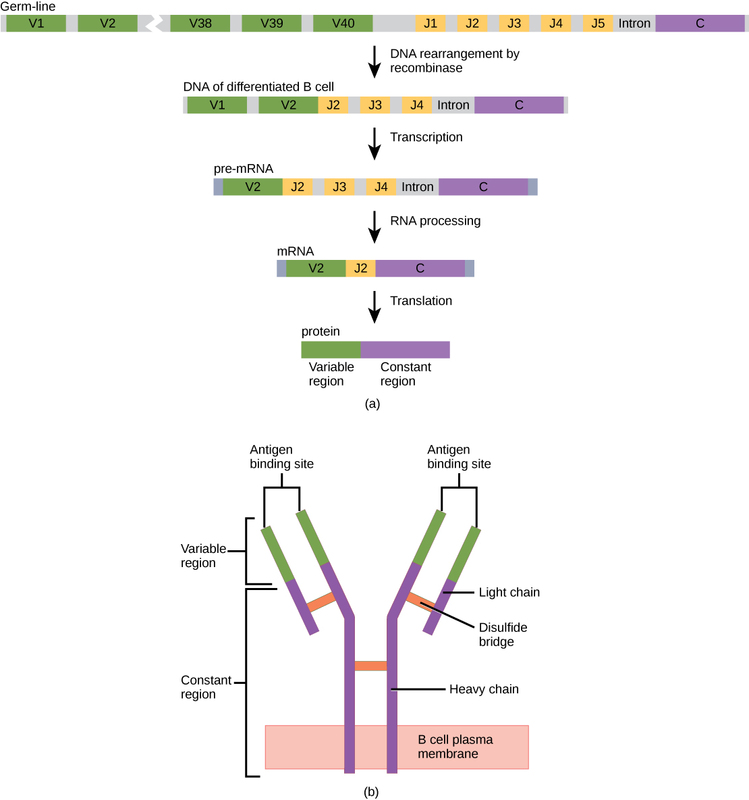 Each antibody has a unique variable region, which is responsible for antigen detection and specificity. There are five classes of antibodies, each utilized by the body under different conditions, including IgM, IgG, IgA, IgD, and IgE; Ig stands for immunoglobulin. IgAs, secreted in the milk, tears and mucous, are the most numerous antibodies produced; inside of the body, circulating IgGs are the most abundant. An antibody is a molecule that recognizes a specific antigen; this recognition is a vital component of the adaptive immune response. Antibodies are composed of four polypeptides: two identical heavy chains (large peptide units) that are partially bound to each other in a “Y” formation, which are flanked by two identical light chains (small peptide units). The area where the antigen is recognized on the antibody is known as the variable domain or variable region. This is why there are numerous antibodies that can each recognize a different antigen. The antibody base is known as the constant domain or constant region. The portion of an antigen that is recognized by the antibody is known as the epitope. Antibodies: (a) As a germ-line B cell matures, an enzyme called DNA recombinase randomly excises V and J segments from the light chain gene. Splicing at the mRNA level results in further gene rearrangement. As a result, (b) each antibody has a unique variable region capable of binding a different antigen. In B cells, the variable region of the light chain gene has 40 variable (V) and five joining (J) segments. An enzyme called DNA recombinase randomly excises most of these segments out of the gene, splicing one V segment to one J segment. During RNA processing, all but one V and J segment are spliced out. Recombination and splicing may result in over 106 possible VJ combinations. As a result, each differentiated B cell in the human body typically has a unique variable chain. The constant domain, which does not bind to an antibody, is the same for all antibodies. The large diversity of antibody structure translates into the large diversity of antigens that antibodies can bind and recognize. Similar to TCRs (T cell receptors) and BCRs (B cell receptors), antibody diversity is produced by the mutation and recombination of approximately 300 different gene segments encoding the light and heavy chain variable domains in precursor cells that are destined to become B cells. The variable domains from the heavy and light chains interact to form the binding site through which an antibody can bind a specific epitope on an antigen. The numbers of repeated constant domains in Ig classes (discussed below) are the same for all antibodies corresponding to a specific class. Antibodies are structurally similar to the extracellular component of the BCRs. The maturation of B cells into plasma cells occurs when the cells gain the ability to secrete the antibody portion of its BCR in large quantities. Antibodies can be divided into five classes (IgM, IgG, IgA, IgD, and IgE) based on their physiochemical, structural, and immunological properties. Ig stands for immunoglobulin, another term for an antibody. IgGs, which make up about 80 percent of all antibodies in circulation, have heavy chains that consist of one variable domain and three identical constant domains. IgA and IgD also have three constant domains per heavy chain, whereas IgM and IgE each have four constant domains per heavy chain. The variable domain determines binding specificity, while the constant domain of the heavy chain determines the immunological mechanism of action of the corresponding antibody class. It is possible for two antibodies to have the same binding specificities, but be in different classes and, therefore, to be involved in different functions. After an adaptive defense is produced against a pathogen, typically plasma cells first secrete IgM into the blood. BCRs on naïve B cells are of the IgM class and, occasionally, the IgD class. IgM molecules comprise approximately ten percent of all antibodies. Prior to antibody secretion, plasma cells assemble IgM molecules into pentamers (five individual antibodies) linked by a joining (J) chain. The pentamer arrangement means that these macromolecules can bind ten identical antigens. However, IgM molecules released early in the adaptive immune response do not bind to antigens as stably as do IgGs, which are one of the possible types of antibodies secreted in large quantities upon re-exposure to the same pathogen. 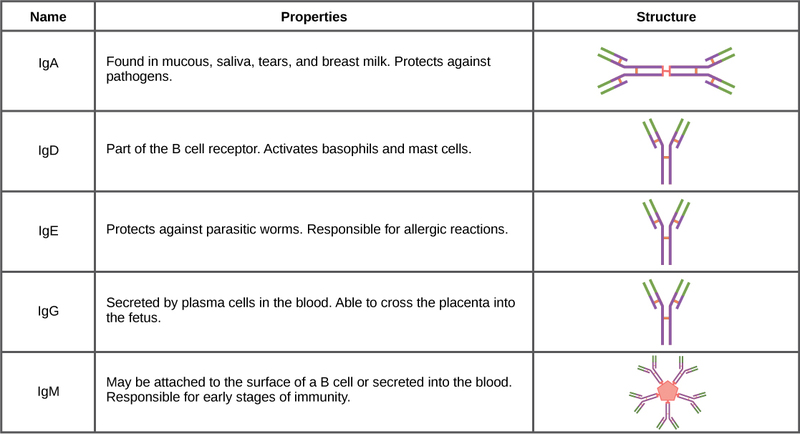 The properties of immunoglobulins and their basic structures are shown in the table. Classes of antibodies: Immunoglobulins (antibody classes) have different functions, but all are composed of light and heavy chains that form a Y-shaped structure. IgAs populate the saliva, tears, breast milk, and mucus secretions of the gastrointestinal, respiratory, and genitourinary tracts. Collectively, these bodily fluids coat and protect the extensive mucosa (4000 square feet in humans). The total number of IgA molecules in these bodily secretions is greater than the number of IgG molecules in the blood serum. A small amount of IgA is also secreted into the serum in monomeric form. Conversely, some IgM is secreted into bodily fluids of the mucosa. Similarly to IgM, IgA molecules are secreted as polymeric structures linked with a J chain. However, IgAs are secreted mostly as dimeric molecules, not pentamers. IgE is present in the serum in small quantities and is best characterized in its role as an allergy mediator. IgD is also present in small quantities. Similarly to IgM, BCRs containing the IgD class of antibodies are found on the surface of naïve B cells. This class supports antigen recognition and subsequent maturation of B cells to plasma cells. Antibodies, part of the humoral immune response, are involved in pathogen detection and neutralization. Antibodies are produced by plasma cells, but, once secreted, can act independently against extracellular pathogen and toxins. Antibodies bind to specific antigens on pathogens; this binding can inhibit pathogen infectivity by blocking key extracellular sites, such as receptors involved in host cell entry. Antibodies can also induce the innate immune response to destroy a pathogen, by activating phagocytes such as macrophages or neutrophils, which are attracted to antibody-bound cells. Affinity describes how strongly a single antibody binds a given antigen, while avidity describes the binding of a multimeric antibody to multiple antigens. A multimeric antibody may have individual arms with low affinity, but have high overall avidity due to synergistic effects between binding sites. Cross reactivity occurs when an antibody binds to a different-but-similar antigen than the one for which it was raised; this can increase pathogen resistance or result in an autoimmune reaction. Differentiated plasma cells are crucial players in the humoral immunity response. The antibodies they secrete are particularly significant against extracellular pathogens and toxins. Once secreted, antibodies circulate freely and act independently of plasma cells. Sometimes, antibodies can be transferred from one individual to another. For instance, a person who has recently produced a successful immune response against a particular disease agent can donate blood to a non-immune recipient, confering temporary immunity through antibodies in the donor’s blood serum. This phenomenon, called passive immunity, also occurs naturally during breastfeeding, which makes breastfed infants highly resistant to infections during the first few months of life. Antibodies coat extracellular pathogens and neutralize them by blocking key sites on the pathogen that enhance their infectivity, such as receptors that “dock” pathogens on host cells. Antibody neutralization can prevent pathogens from entering and infecting host cells, as opposed to the cytotoxic T-cell-mediated approach of killing cells that are already infected to prevent progression of an established infection. The neutralized antibody-coated pathogens can then be filtered by the spleen and eliminated in urine or feces. 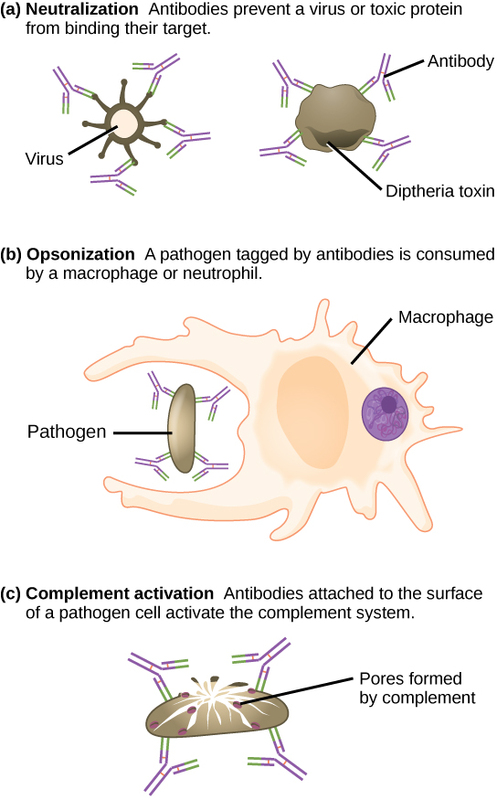 Mechanisms of antibody action: Antibodies may inhibit infection by (a) preventing the antigen from binding to its target, (b) tagging a pathogen for destruction by macrophages or neutrophils, or (c) activating the complement cascade. Antibodies also mark pathogens for destruction by phagocytic cells, such as macrophages or neutrophils, because they are highly attracted to macromolecules complexed with antibodies. Phagocytic enhancement by antibodies is called opsonization. In another process, complement fixation, IgM and IgG in serum bind to antigens, providing docking sites onto which sequential complement proteins can bind. The combination of antibodies and complement enhances opsonization even further, promoting rapid clearing of pathogens. Not all antibodies bind with the same strength, specificity, and stability. In fact, antibodies exhibit different affinities (attraction) depending on the molecular complementarity between antigen and antibody molecules. An antibody with a higher affinity for a particular antigen would bind more strongly and stably. It would be expected to present a more challenging defense against the pathogen corresponding to the specific antigen. 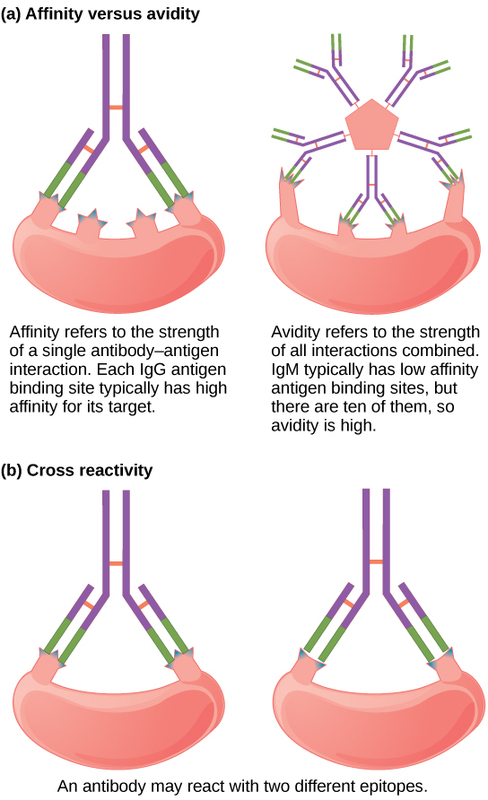 Antibody affinity, avidity, and cross reactivity: (a) Affinity refers to the strength of single interactions between antigen and antibody, while avidity refers to the strength of all interactions combined. (b) An antibody may cross-react with different epitopes. The term avidity describes binding by antibody classes that are secreted as joined, multivalent structures (such as IgM and IgA). Although avidity measures the strength of binding, just as affinity does, the avidity is not simply the sum of the affinities of the antibodies in a multimeric structure. The avidity depends on the number of identical binding sites on the antigen being detected, as well as other physical and chemical factors. Typically, multimeric antibodies, such as pentameric IgM, are classified as having lower affinity than monomeric antibodies, but high avidity. Essentially, the fact that multimeric antibodies can bind many antigens simultaneously balances their slightly-lower-binding strength for each antibody/antigen interaction. Antibodies secreted after binding to one epitope on an antigen may exhibit cross reactivity for the same or similar epitopes on different antigens. Cross reactivity occurs when an antibody binds not to the antigen that elicited its synthesis and secretion, but to a different antigen. Because an epitope corresponds to such a small region (the surface area of about four to six amino acids), it is possible for different macromolecules to exhibit the same molecular identities and orientations over short regions. Cross reactivity can be beneficial if an individual develops immunity to several related pathogens despite having been exposed to or vaccinated against only one of them. For instance, antibody cross reactivity may occur against the similar surface structures of various Gram-negative bacteria. Conversely, antibodies raised against pathogenic molecular components that resemble self molecules may incorrectly mark host cells for destruction, causing autoimmune damage. Patients who develop systemic lupus erythematosus (SLE) commonly exhibit antibodies that react with their own DNA. These antibodies may have been initially raised against the nucleic acid of microorganisms, but later cross-reacted with self-antigens. This phenomenon is also called molecular mimicry.